Background: Stevia (Stevia rebaudiana) is a plant of nutritional and industrial importance for its diverse steviol glycosides. Stevioside, rebaudioside-A and their aglycon steviol – 200-300 times sweeter than normal sucrose are novel contenders for the development of antidiabetic drugs. Stevia leaf flavor at different harvest stages is a function of the metabolite content, which results from physiological changes during plant growth and development. Objectives: The main purpose of this study was to investigate metabolite changes during plant development using GC-MS metabolic profiling and HPTLC and to analyze expression of key genes of steviol glycoside biosynthetic pathway by qPCR. Material Methods: Metabolite data and gene expression from leaf samples of eight developmental stages underwent a variety of chemometric analyses, to identify the true differences between samples. Results: There was a significant increase of steviol from 0.23% to 6.6%, stevioside from 3.3% to 14.23%, rebaudioside-A from 0.826% to 4.99% and (+)-isomenthol showed decrease in concentration from 16.79% to 5.23% with plant growth. srUGTs, srKO, srKS, srKAH, srUGP1, and srDXR increased whereas expression of (+)-srLMS and srNMD decreased with plant progression. Metabolite and gene correlation analysis revealed the interdependencies of individual metabolites and metabolic pathways genes. Conclusion: These results will help in selecting and utilizing the appropriate traits in Stevia crop. Abbreviations used: SG: Steviol glycosides; PCA: Principal component analysis; VIP: Variable importance in the projection; UGT: Uracil glycosyltransferase. 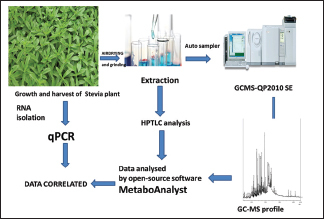 Metabolites identified by GC-MS from methanolic extract of stevia leaf represented steviols, phytosterols, limonenes and fatty acid biosynthetic pathways. Key metabolites: Steviol, stevioside, rebaudioside-A, lupeol, stearic acid and beta amyrin increased, whereas (+)-isomenthol,methyl linolenate, phytol acetate and stigmasterol decreased with leaf maturation. Expression of srDXR, srKS, srKO, srKAH, srUTGT76G1, srUGT85C2 and srUGT74G1 genes increased whereas, expression of srNMD and srLMS decreased with the stevia leaf maturation. Stevia rebaudiana, perennial shrub is famous for the presence of steviol glycosides (SGs) that are not found in any other organisms. Stevia is cultivated globally in China, Japan, Australia, Canada, USA, and India. In India, it is predominantly cultivated in Rajasthan, Kerala, Maharashtra, Orissa, and Himachal Pradesh, and has been expanded to the other parts of the country. This plant has conventionally been used as a sweetener for centuries in these parts of the world. In modern times, it is used as sweetening agent in commercial products such as carbonated drinks, confectioneries as noncalorie sweeteners. In addition, euglycemic nature of Stevia gives it an upper hand over sweeteners (natural and artificial) present in the market. SGs modulates taste responses and insulin release by activating transient receptor potential cation channel subfamily M member 5 (TRPM5) ion channel and potentiation of TRPM5 activity protects mice against the development of high-fat diet-induced hyperglycemia. Thus, stevioside, rebaudioside-A, and their aglycon steviol are novel contenders for the development of antidiabetic drugs. Stevia is harvested mainly for its SGs. Stevia has the potential to replace natural and artificial sugars as sweeteners. Along with SGs, Stevia is source of a broad range of compounds, that has valuable pharmacological activities; anti-hypertensive, anti-microbial, and anti-fungal properties. In systems-wide analyses, accurate identification, and quantification of small molecules are the essential first steps to recognize and measure the concentration of metabolites. Chemical analysis of Stevia has been developed during the past years through high-performance liquid chromatography (HPLC) with ultraviolet detection, LC coupled with mass spectrometry (MS), gas chromatography (GC)-MS are some of these. However, in Stevia, these methods have been only employed for the analysis of targeted compounds, main compounds belonging to SG pathway. Untargeted compounds of different developmental stages in Stevia have not been well documented. During the development of the plant, primary and secondary metabolites show considerable variation in different tissues. Moreover, transcriptome or proteome changes do not always congruous with phenotypic alterations. These factors make the metabolome along with gene expression quantification essential. Determining the developmental changes of untargeted primary metabolites along with secondary metabolites and expression of key genes may help us understand the developmental regulation of secondary metabolites. GC-MS has long been used for metabolite profiling owing to its sensitivity, specificity, synchronized analysis, and has relatively broad coverage of compound classes including terpenoids, sugars, sugar alcohols, glycosides, and lipophilic compounds. Due to its high separation efficiency, that can resolve very complex biological mixtures, this technology identifies and quantifies a few hundred metabolites in a single plant extract. Metabolome along with an analysis of key gene expression helps in understanding the Stevia leaf components that are important for output trait. Keeping in view the above facts, the present study was carried out to investigate the changes in metabolic composition and expression of key genes from Stevia leaves from early to flowering stages. In this study, we investigated the variations of organic acids, diterpenes, steviol, and its derivatives. The nontargeted metabolome were determined by GC-MS and targeted by high-performance thin-layer chromatography (HPTLC) using leaf extracts. Expression of key genes, srKO, srKS, srUGT76G1, srUGT74G1, srUGT85C2, srDXR, srKAH, srUGP1, srLMS, and srNMD in all eight stages of leaf development was analyzed using quantitative polymerase chain reaction (qPCR). All the data underwent a variety of chemometric analyses, to ascertain the true variances between samples. Metabolic correlation analysis based on pairwise coefficients were carried out to characterize the physiological response to developmental changes and to find metabolic shifts in pathways during Stevia leaf development. These results will help in selecting the appropriate traits, time period for harvesting the Stevia crop. In future, expression profile of these key genes will help in selecting the appropriate gene modulations– to enhance SGs. Stevia (S. rebaudiana Bertoni) plants obtained from Central Institute of Medicinal and Aromatic Plants, Pant Nagar, Uttrakhand, India, were grown in polyhouse at Jamia Hamdard, New Delhi, India, under controlled conditions, in an artificial climate chamber programmed for 16 h/8 h at 25°C/16°C and day/night environment with a light intensity of 300 μmol/m2/s and relative humidity, 60%. HPLC grade methanol and syringe filters of 0.45 μm from Merck Millipore were used. The standard samples of stevioside and rebaudioside-A were of analytical grade purchased from Sigma-Aldrich USA. Leaves were sampled at 4-week interval from rosette stage to flowering stage. For each sample, there were three technical replicates. The air-dried Stevia leaves were pulverized in mortar and pestle into fine powder. One gram powder of each sample was extracted three times with 5 ml of methanol at room temperature and sonicated for 15 min and centrifuged. The extract was concentrated to 1 ml by vacuo. After centrifugation solvent portion was collected and filtered using syringe filters (0.45 μm). Samples then were immediately analyzed using GC-MS for the analysis of untargeted and HPTLC for targeted metabolites. The GC-MS analysis was performed with a GC-MS QP-2010 ULTRA equipped with an autosampler (AOC-20i + s) from Shimadzu (Japan), using Equity-5 column, 30.0 m × 0.25 um × 0.25 mm for separation, and helium was used as a carrier gas at a constant flow rate of 1.0 mL/min. The 1μL sample was injected using 1/100 split-mode injections at a temperature of 260°C. The oven temperature program was initially set at 100°C and held for 2 min. The temperature was gradually increased to 250°C at a rate of 10°C/min, and 300°C at 15°C/min. Electrons from the filament were accelerated to 70 eV and directed into the ionization chamber. Total ion chromatogram spectra were recorded in the mass range of 40–900 m/z at the rate of 2.5 scan/s. Peaks were identified using WILEY8 spectral library, National Institute of Standards and Technology (NIST) 14s, internal libraries and further confirmed with ChEBI (http://www.ebi.ac.uk/chebi/init.do) and ChemSpider (http://www.chemspider.com/). For metabolite identification and annotation, peaks were matched against customized reference spectrum databases including the NIST and the Wiley Registry. Data obtained was then uploaded to the web-based tool MetaboAnalyst for high throughput analysis. The data were log normalized (log2) to make data more comparable. Standard solutions of stevioside and rebaudioside-A were prepared by adding 1.0 mg to 1.0 mL of methanol to prepare a 1.0 mg/mL standard. This stock standard was then used to prepare standard dilution of 0.1 mg/mL to 0.6 mg/mL of stevioside and rebaudioside-A by appropriate dilution in the mobile phase. HPTLC was performed as per the already optimized method in our laboratory, with few modifications. Leaf samples were pulverized in mortar pestle and after dissolving in methanol, samples were sonicated for 15 min. This process was repeated three times and finally, sample was concentrated to 1 ml. Chloroform: methanol: water (60:32:4 v/v/v) was used as mobile phase. After drying, plates were then derivatized with freshly prepared anisaldehyde spraying reagent (glacial acetic acid–concentrated: H2 SO4: anisaldehyde, 50:1:0.5 v/v/v) for post-chromatographic derivatization followed by heating at 100°C−110°C for 5–7 min. The compounds stevioside and rebaudioside-A in each sample were identified by comparing their retention with their respective standard peaks. The GC-MS data matrix after log normalization was used for multivariate analysis. The multivariate data matrix was analyzed by MetaboAnalyst (http://www.metaboanalyst.ca/). Principal component analysis (PCA) was used for an unsupervised analysis and least squares-discriminant analysis (PLS-DA) for a supervised analysis. 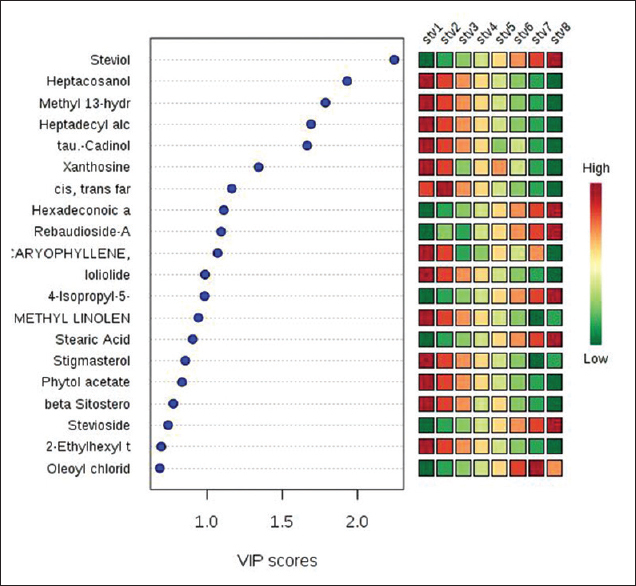 A PCA scatter plot of variables showing different metabolites was obtained to explain the separation of samples from different Stevia developmental stages. A range of metabolites was selected as the variable importance in the projection (VIP) based on orthogonal projection to latent structures-discriminate analysis (OPLS-DA) method. Finally, Spearman's hierarchical clustering algorithm was used to group metabolites that have the same pattern of distribution. 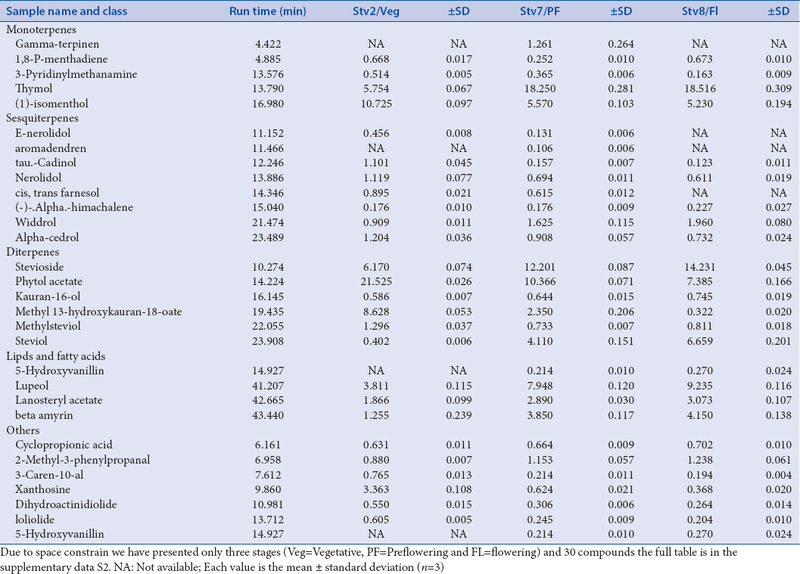 Spearman's correlation coefficient, ρ was calculated for each metabolite within and between 61 annotated peaks of eight stages [Supplementary Table S1]. Spearman's correlation coefficient ranges from–1 (perfect negative correlation) to 1 (perfect positive correlation) with 0 indicating no correlation. We chose Spearman's correlation coefficient over Pearson's correlation coefficient because it is insensitive to monotonic nonlinearities in relationships and less sensitive to outliers. Publicly available data from the Kyoto Encyclopedia of Genes and Genomes pathway database were obtained to understand and confirm the relationship between metabolite-metabolite correlations. Leaves (100 mg) were sampled at 4-week interval from rosette stage to flowering stage. Tissues were crushed under liquid nitrogen using mortar and pestle. Total RNA was extracted from leaf according to the manufacturer's protocol Plant RNeasy Mini kit (Qiagen, Germany). Genomic DNA was digested by treating each sample with DNase I (Sigma Aldrich). The concentration and purity of RNA samples were measured using NanoDrop spectrophotometer (ND1000). The genetic integrity was evaluated by subjecting RNA to 1.5% agarose gel electrophoresis. Complementary DNA (cDNA) was synthesized from 1 μg total RNA using Verso cDNA (Thermo scientific). Eight SG pathway-related genes (srKO, srKS, srUGT85C2, srUGT74G1, srUGT76G1, srDXR, srKAH, and srUGP1) and two monoterpene biosynthetic pathway related gene (srLMS and srNMD) were selected. Potential homologs of these genes were identified from the genome and transcriptome data sequences of S. rebaudiana. The potential homologs sequences were aligned and edited by using BLAST Sequence Alignment tool. Primers were designed using IDT PrimerQuest tool (http://eu. idtdna. com/primerquest/home/index) and analyzed in OligoAnalyser (https://eu. idtdna. com/calc/analyzer) according to the manufacturer's instructions. The primer sequence along with their accession number and amplicon size are provided in [Table 1]. Amplicon specificity and size were verified by semi-qPCR and gel electrophoresis, respectively [Figure 1]. qPCR was carried out in optical 96-well plate with LightCycler® 480 System (Roche Diagnostics) using SYBR Green I. The qPCR was designed according to the MIQE (minimum information for publication of quantitative real-time PCR experiment) guidelines. Reaction mixtures contained 10 μL SYBR Green I Mix, 2 μL diluted cDNA, double distilled water, and a final primer concentration of 0.4 μM. The following amplification conditions were applied: an initial denaturation step of 95°C for 30 s; 40 cycles at 95°C for 30s; and 55°C for 30s. The final dissociation curve was obtained from 65°C to 95°C to verify primer specificity. Each assay included two technical and biological replicates. The general quality assessment of the PCR results was based on the amplification and melting curve profiles of the samples in relation to the assay controls (nontemplate controls). Relative expression profiles of the key genes were calculated by converting quantitation cycle (Cq) value to 2−ΔΔct. SAND and actin in combination were found to be best genes for the gene assay normalization in different developmental stages (Data unpublished). Thus, gene expression of all the genes were normalized against two reference genes SAND and actin. Stevia was grown in greenhouse and different stages of leaves were harvested for metabolite analysis. These samples were collected every 4 weeks. 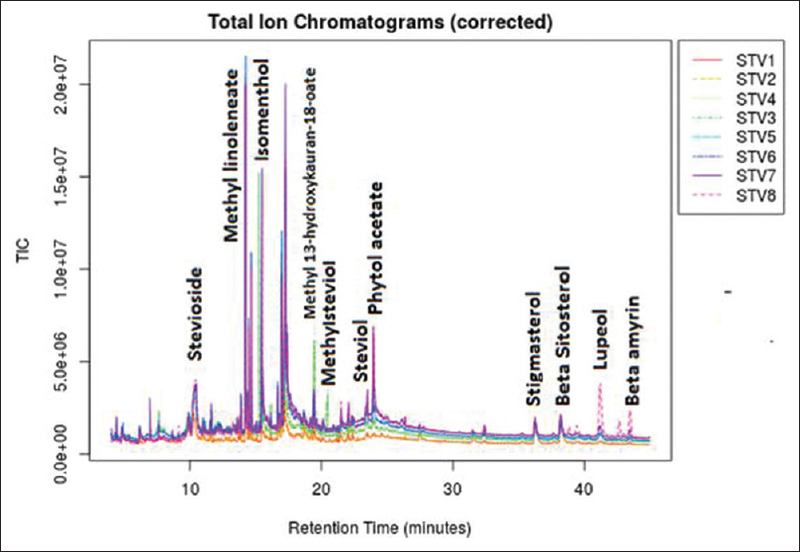 Chromatographic peaks obtained from GC-MS of Stevia leaves extracted in methanol were identified using the NIST14s and Wiley8 databases. Preliminary GC-MS metabolites acquired from all eight stages identified were > 350 resolved peaks, shown as an overlay in [Figure 2]. Nearly 55% of these peaks could be identified as distinct metabolites with known chemical structure. These identified metabolites represent numerous metabolic pathways, including biosynthesis of SG, phytosterols, (+)-isomenthol and fatty acids biosynthetic pathway. Initial analysis of GC-MS showed change in metabolite concentration at different developmental stages. Steviol, lupeol, stearic acid, beta-amyrin, and hexadecanoic acid increased, whereas (+)-isomenthol, methyl linolenate, phytol acetate, and stigmasterol showed drastic decrease with leaf maturation. The most relatively abundant metabolites were glycosides, organic acids, alcohols, steviol, lupeol, oleoyl chloride, phytol acetate, xanthosine, and (+)-isomenthol [Table 2]. HPTLC was used to investigate the changes in stevioside and rebaudioside-A contents, two industrially important glycosides at different developmental stages of Stevia leaf. PCA analysis on the profiles of stevioside and rebaudioside-A gave a clear cluster pattern. With the Stevia leaf maturation, stevioside, and rebaudioside-A increased drastically. Stevioside was minimum at early stage (3%) and maximum at flowering stage (14%), whereas rebaudioside-A showed increase from 0.8% to 4% at flowering stage [Table 2]. SGs are 200–300 times sweeter than normal sucrose, but stevioside has aftertaste bitterness, whereas rebaudioside-A is the least astringent, the least bitter, has the least persistent aftertaste and is judged to have the most favorable sensory attributes. Steviol and its derivatives stevioside and rebaudioside-A modulates insulin release which makes the novel and effective contenders as anti-diabetic and euglycemic drugs. Stage 2 and 3 showed minute differences in these metabolites, thereby suggesting minimum developmental changes in these metabolites as the said stages. Variety of monoterpenes with varying concentrations were found. Among all monoterpenes, (+)-isomenthol has a substantial 16% concentration of all the metabolites at stage 1 and drastically decreases with plant advancement. Stevia leaf has a bitter and astringent aftertaste which frequently is also described as menthol-like. In all various commercially available Stevia products, this aftertaste in the extract of leaves is a great problem. (+)-isomenthol is thus the ideal target for further analysis to improve the stevia leaf quality. To evaluate the metabolites for different developmental stages, data were log normalized to make them more comparable. PLS-DA, OPLS-DA and Heatmap analysis were carried out in the study. Score plots from the supervised OPLS-DA showed obvious separation of metabolites among different plant developmental stages. The heatmap, commonly used for unsupervised clustering, was constructed based on OPLS-DA analysis. 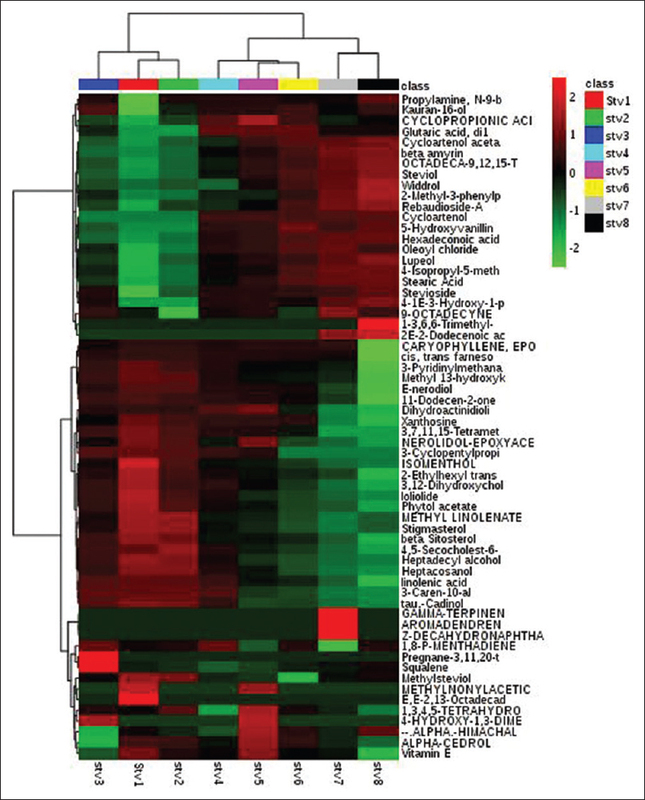 The heatmap [Figure 3] showed differential distribution of metabolites during leaf development and maturation. Steviol and its derivatives exhibited significant increase during leaf development, while the accumulation pattern of each metabolite was very different. Cluster analysis allowed the distinction between samples that were collected at the different stages. Important metabolites in these samples that affected cluster formation could be determined. The data suggested that concentration of monoterpene decreased with leaf maturation in contrary to SGs. Correlation analysis is an important tool to explore metabolic pathways (Supplementary data S1). Spearman's correlation for each metabolite at different stages demarcated the changes during Stevia leaf maturation. Correlation analysis of the 61 differential metabolites, marked on the hierarchical clustering plot was performed to understand the potential relationships between metabolites. Stevioside showed positive correlation with steviol (r = 0.9887), rebaudioside-A (r = 0.82713), and Kauran-16-ol (r = 0.40957). Both stevioside, rebaudioside-A and their precursor, steviol showed negative correlations with monoterpene (+)-isomenthol (r=-0.98783). Stigmasterol showed positive correlation with beta-sitosterol (r = 0.94174) and negative correlation with cycloartenol (r = −0.91819). VIP projection [Figure 4] showed top twenty features of the metabolite markers that change significantly at different developmental stages. The score plots of PCA and OPLS-DA [Figure 5]b results showed clear separation among plant metabolites of Stevia from stage 1 to stage 8. A significant difference exists in the metabolite profiles among samples of different leaf stages. Based on the PCA results [Figure 5]a, a separation of metabolite peaks at different developmental stages was observed. After clustering using algorithm ward. D and distance measurements using spearman correlation, stage 2 and stage 3 have the most similar metabolite content of the eight developmental stages, suggesting the least changes during developmental progression. Significant changes in metabolite composition were detected between stages 3 and 4 due to the developmental transition from cell expansion to cell maturation. Stage 7 (flowering) and stage 8 (postflowering) had considerable changes in metabolites [Supplementary Table S2]. 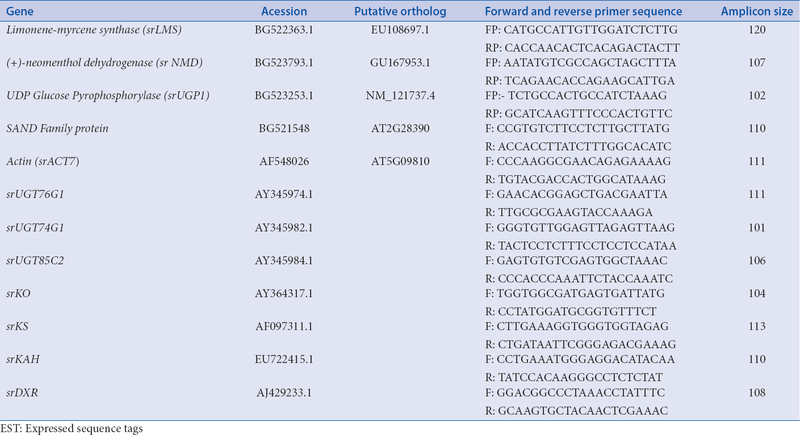 Full-length sequences were retrieved from S. rebaudiana transcriptome on the basis of homology analysis with sequences present in NCBI database [Table 1]. Specific primers were designed and confirmed on the basis of the amplification specificity and efficiency results of the candidate genes. 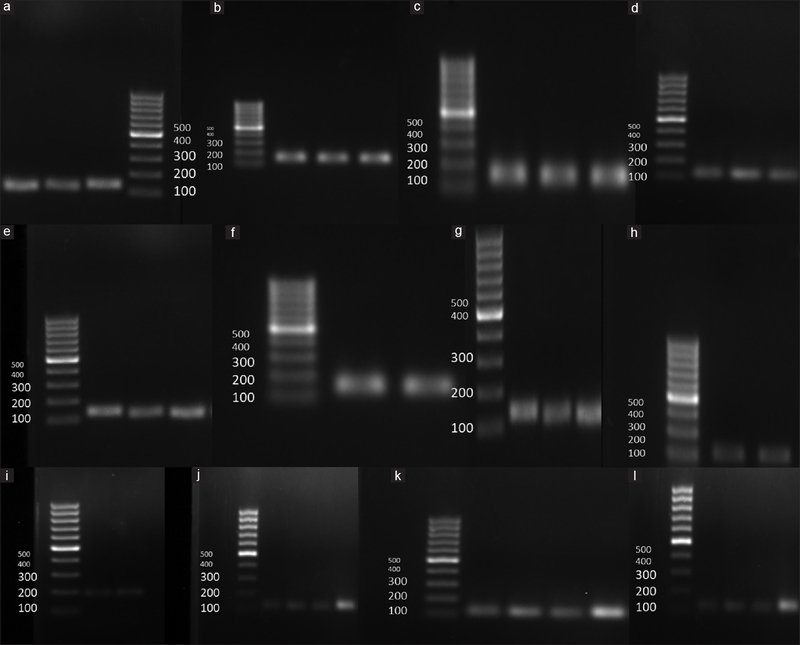 All primers amplified PCR products of the expected sizes, which were confirmed by 1.2% agarose gel electrophoresis. The presence of a single band in each case ruled out the presence of primer-dimer and single-peak melting curves were obtained in all qPCR amplifications. RNA isolated from all leaf samples were reverse transcribed to cDNA for further use in qPCR detection. The Cq values of all genes in all the samples, namely, different tissue samples at different developmental stages were determined by qPCR. Cq value showed differential transcript levels in all the tissue samples. The lower Cq value corresponds to higher transcript abundance and vice versa. The mean Cq values of all the genes ranged from 12.21-30.61. RNA transcript levels varied considerably from stage to stage. 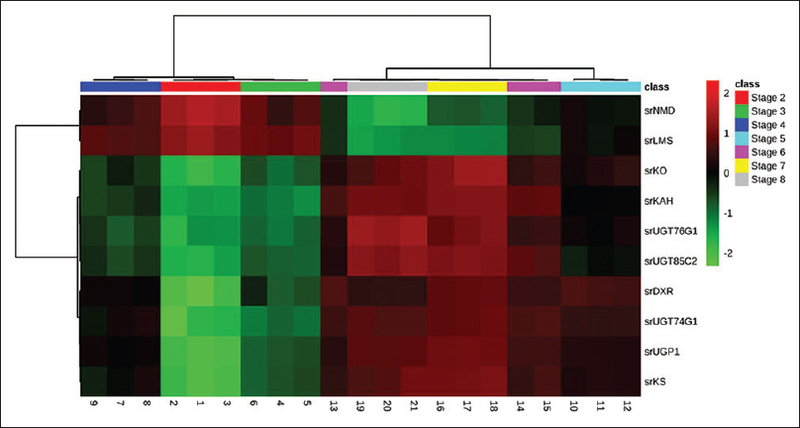 Compared with stage 1 expression of srDXR, srKS, srKO, srKAH, srUTGT76G1, srUGT85C2, and srUGT74G1 increased, whereas expression of srNMD and srLMS decreased with the stevia leaf maturation from stage 1 to stage 8 [Figure 6]. Sweetness of Stevia leaf varies considerably with plant development, thus metabolome analysis will help in identifying the important traits at particular time period. An extensive and comprehensive metabolite profile in Stevia at different developmental stages can help identify the proper harvest period and appropriate traits. This study provides a comprehensive and comparative analysis targeted metabolites by HPTLC and nontargeted metabolite composition using GC-MS of Stevia leaf from eight different developmental stages. Stevioside was minimum at early stage (3%) and maximum at flowering stage (14%), whereas rebaudioside-A showed increase from 0.8% to 4% at flowering stage SGs are 200–300 times sweeter than normal sucrose, but stevioside has aftertaste bitterness whereas rebaudioside-A is the least astringent, the least bitter, has the least persistent aftertaste and is judged to have the most favorable sensory attributes. Steviol and its derivatives stevioside and rebaudioside-A modulates insulin release which makes the novel and effective contenders as anti-diabetic and euglycemic drugs. Stage 2 and 3 showed minute differences in these metabolites, thereby suggesting minimum developmental changes in these metabolites as the said stages. Variety of monoterpenes with varying concentrations were found. Among all monoterpenes, (+)-isomenthol has a substantial 16% concentration of all the metabolites at stage 1 and drastically decreases with plant advancement. Bitter and astringent aftertaste which frequently is also described as menthol-like has been reported earlier, this might be due to the high content of (+)-isomenthol. In all various commercially available Stevia products, this aftertaste in the extract of leaves is a great problem. The data presented here allow the analysis of glycosides, monoterpenes, diterpenes, triterpenes, and fatty acid. Main flux of carbon for the biosynthesis of sesquiterpenes is contributed by MEP and the MVA pathways, whereas carbon flux for mono- and diterpenes, specifically, SGs, comes from MEP pathway. Diterpenes (steviol and derivatives), triterpenes; cycloartenol, beta-amyrin and lupeol increased with stevia leaf maturation. Sesquiterpenes; neorolidol, tau-cadinol, beta-caryophyllene and alpha cedrol– monoterpenes; (+)-isomenthol, carvon showed significant decrease in concentration with Stevia leaf maturation. Thus harvesting Stevia for SGs at late stages will be reasonable rather than early stages. Simultaneous gene expression and metabolomics data analysis can facilitate generating new hypotheses and prioritization of genes/metabolites for targeted follow-up experimentations. Various metabolites were detected by GC-MS and HPTLC, thus, related key genes, namely, srKO, srKS, srUGT76G1, srUGT74G1, srUGT85C2, srDXR, srKAH, srUGP1, srLMS, and srNMD were selected for gene expression studies using qPCR in Stevia. Genes srDXR, srKS, srKO, srKAH, and srUGTs, were chosen as they are directly involved in SG pathway,– srLMS and srNMD participates in monoterpenoid biosynthesis,srUGP1 is needed in every glycosylation steps in steviol biosynthetic pathway. Expression of genes related to SG pathway (srKO, srKS, srUGT76G1, srUGT74G1, srUGT85C2, srDXR, srKAH, and srUDP1) showed a considerable increase, Gopal et al. in 2017 have also suggested the same pattern of expression of these genes, whereas srLMS and srNMD decreased with Stevia leaf development and maturation. Expression pattern of genes and metabolome analysis suggests that the biosynthesis of diterpenes increases with Stevia leaf maturation, whereas monoterpenes decreases significantly. The expression pattern of genes showed high correlation with the respective metabolite content. The genes could be further modulated by gene editing systems (CRISPR, RNAi, microRNA) to regulate the expression of the particular compound by metabolic engineering to develop new traits in Stevia. Based on the above results of our study, rebaudioside-A, stevioside, steviol, and methlysteviol and their respective genes (srDXR, srKO, srKAH, srUTGT76G1, srUGT85C2 and srUGT74G1) showed increased expression. Whereas expression of (+)-isomenthol, stigmasterol, linalool in Stevia and their pathway-related genes (srNMD and srLMS) decreased with progression of leaf developmental stages. Expression of srUGP1 was in high correlation with genes involved in SG biosynthetic pathway. Thus can be the ideal target for scientists to enhance the SGs in Stevia. This study will help researches in identifying the proper ratio between SGs and other terpenes to improve the taste quality of Stevia leaves. Based on the results, desired traits could be chosen and unwanted traits could be avoided. This work was financially supported by the University Grant Commission (UGC), New Delhi under SAP-DRS II Program, UGC-BSR fellowship and the facilities provided by the Department of Biotechnology, Jamia Hamdard, New Delhi-110062. Singh G, Singh G, Singh P, Parmar R, Paul N, Vashist R, et al. Molecular dissection of transcriptional reprogramming of steviol glycosides synthesis in leaf tissue during developmental phase transitions in Stevia rebaudiana bert. Sci Rep 2017;7:11835. Chatsudthipong V, Muanprasat C. Stevioside and related compounds: Therapeutic benefits beyond sweetness. Pharmacol Ther 2009;121:41-54. Philippaert K, Pironet A, Mesuere M, Sones W, Vermeiren L, Kerselaers S, et al. Steviol glycosides enhance pancreatic beta-cell function and taste sensation by potentiation of TRPM5 channel activity. Nat Commun 2017;8:14733. Lemus-Mondaca R, Vega-Gálvez A, Zura-Bravo L, Ah-Hen K. Stevia rebaudiana bertoni, source of a high-potency natural sweetener: A comprehensive review on the biochemical, nutritional and functional aspects. Food Chem 2012;132:1121-32. Ferri LA, Alves-Do-Prado W, Yamada SS, Gazola S, Batista MR, Bazotte RB, et al. Investigation of the antihypertensive effect of oral crude stevioside in patients with mild essential hypertension. Phytother Res 2006;20:732-6. Ghosh S, Subudhi E, Nayak S. Antimicrobial assay of Stevia rebaudiana Bertoni leaf extracts against 10 pathogens plant materials and microorganisms determination of minimum inhibitory concentration (MIC). Int J Integr Biol 2008;2:27-31. Aranda-González I, Moguel-Ordoñez Y, Betancur-Ancona D. Validation of HPLC-UV method for determination of minor glycosides contained in Stevia rebaudiana Bertoni leaves. Biomed Chromatogr 2015;29:733-8. Karaköse H, Jaiswal R, Kuhnert N. Characterization and quantification of hydroxycinnamate derivatives in Stevia rebaudiana leaves by LC-MSn. J Agric Food Chem 2011;59:10143-50. Wölwer-Rieck U, May B, Lankes C, Wüst M. Methylerythritol and mevalonate pathway contributions to biosynthesis of mono-, sesqui-, and diterpenes in glandular trichomes and leaves of Stevia rebaudiana Bertoni. J Agric Food Chem 2014;62:2428-35. Rochfort S. Metabolomics reviewed: A new “omics” platform technology for systems biology and implications for natural products research. J Nat Prod 2005;68:1813-20. Gul I, Nasrullah N, Nissar U, Saifi M, Abdin MZ. Development of DNA and GC-MS Fingerprints for Authentication and Quality Control of Piper nigrum L. and Its Adulterant Carica papaya L. Food Analytical Methods 2018;11:1209-22. Saifi M, Ali A, Saini M, Nasrullah N, Khan S, Abdin MZ. A rapid and efficient high performance thin layer chromatographic (HPTLC) method for simultaneous analysis of stevioside and rebaudioside-a in Stevia Rebaudiana. Int J Pharm Pharm Sci 2014;6:455-64. Saifi M, Nasrullah N, Ahmad MM, Ali A, Khan JA, Abdin MZ. In silico analysis and expression profiling of MiRNAs targeting genes of steviol glycosides biosynthetic pathway and their relationship with steviol glycosides content in different tissues of Stevia rebaudiana . Plant Physiol Biochem 2015;94:57-64. Brandle JE, Telmer PG. Steviol glycoside biosynthesis. Phytochemistry 2007;68:1855-63. Bustin SA, Benes V, Garson JA, Hellemans J, Huggett J, Kubista M, et al. The MIQE guidelines: Minimum information for publication of quantitative real-time PCR experiments. Clin Chem 2009;55:611-22. DuBois GE, Stephenson RA. Diterpenoid sweeteners. Synthesis and sensory evaluation of stevioside analogues with improved organoleptic properties. J Med Chem 1985;28:93-8. Kienle U. Method of making a natural sweetener based on Stevia rebaudiana , and use there of. U S Pat 1992;112:610. Prosser GA, Larrouy-Maumus G, de Carvalho LP. Metabolomic strategies for the identification of new enzyme functions and metabolic pathways. EMBO Rep 2014;15:657-69. Degenhardt J, Köllner TG, Gershenzon J. Monoterpene and sesquiterpene synthases and the origin of terpene skeletal diversity in plants. Phytochemistry 2009;70:1621-37. Li Y, Li Y, Wang Y, Chen L, Yan M, Chen K, et al. Production of rebaudioside A from stevioside catalyzed by the engineered saccharomyces cerevisiae. Appl Biochem Biotechnol 2016;178:1586-98.